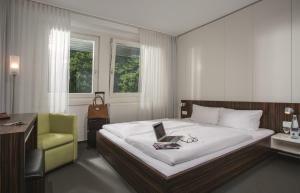 The hotel is just 25 km from Berlin city centre and 10 km from the A10 motorway, and parking is free. These large, elegant rooms are located in the main building. These rooms are in the annexe. These large, elegant rooms are located in the main building. One extra bed is available (see Hotel Policies). This luxury junior suite offers a spacious seating area, and is located in the main building.